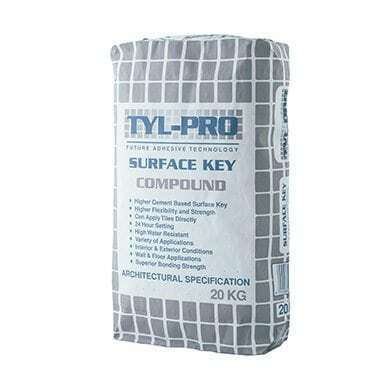 Application: TYL-PRO SURFACE KEY COMPOUND is a multipurpose rapid hardening water resistant cement-based primer for the use on previously painted surfaces, smooth and dense surfaces and used as a waterproofing primer in swimming pools, showers, balconies etc. Suited for use in interior and exterior conditions, walls and floors. The product must be mixed with TYL-PRO Keying Agent and allowed 24 hours to dry prior to tile application.